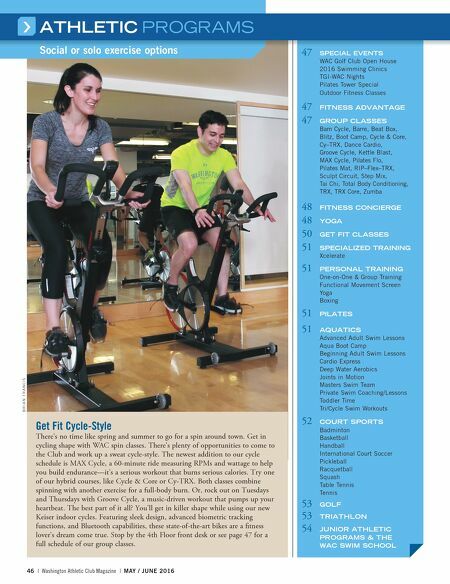 B R I A N F R A N C I S 46 | Washington Athletic Club Magazine | MAY / JUNE 2016 ATHLETIC PROGRAMS Social or solo exercise options ATHLETIC PROGRAMS Social or solo exercise options 47 SPECIAL EVENTS WAC Golf Club Open House 2016 Swimming Clinics TGI-WAC Nights Pilates Tower Special Outdoor Fitness Classes 47 FITNESS ADVANTAGE 47 GROUP CLASSES Bam Cycle, Barre, Beat Box, Blitz, Boot Camp, Cycle & Core, Cy–TRX, Dance Cardio, Groove Cycle, Kettle Blast, MAX Cycle, Pilates Flo, Pilates Mat, RIP–Flex–TRX, Sculpt Circuit, Step Mix, Tai Chi, Total Body Conditioning, TRX, TRX Core, Zumba 48 FITNESS CONCIERGE 48 YOGA 50 GET FIT CLASSES 51 SPECIALIZED TRAINING Xcelerate 51 PERSONAL TRAINING One-on-One & Group Training Functional Movement Screen Yoga Boxing 51 PILATES 51 AQUATICS Advanced Adult Swim Lessons Aqua Boot Camp Beginning Adult Swim Lessons Cardio Express Deep Water Aerobics Joints in Motion Masters Swim Team Private Swim Coaching/Lessons Toddler Time Tri/Cycle Swim Workouts 52 COURT SPORTS Badminton Basketball Handball International Court Soccer Pickleball Racquetball Squash Table Tennis Tennis 53 GOLF 53 TRIATHLON 54 JUNIOR ATHLETIC PROGRAMS & THE WAC SWIM SCHOOL Get Fit Cycle-Style There's no time like spring and summer to go for a spin around town. Get in cycling shape with WAC spin classes. There's plenty of opportunities to come to the Club and work up a sweat cycle-style. The newest addition to our cycle schedule is MAX Cycle, a 60-minute ride measuring RPMs and wattage to help you build endurance—it's a serious workout that burns serious calories. Try one of our hybrid courses, like Cycle & Core or Cy-TRX. Both classes combine spinning with another exercise for a full-body burn. Or, rock out on Tuesdays and Thursdays with Groove Cycle, a music-driven workout that pumps up your heartbeat. The best part of it all? You'll get in killer shape while using our new Keiser indoor cycles. Featuring sleek design, advanced biometric tracking functions, and Bluetooth capabilities, these state-of-the-art bikes are a fitness lover's dream come true. 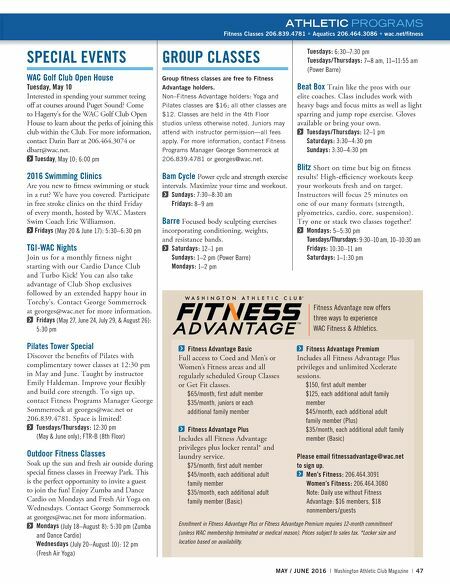 Stop by the 4th Floor front desk or see page 47 for a full schedule of our group classes.